MIAMI, Florida (WABC) -- Funeral services were held Wednesday for two men from the Orthodox community in Williamsburg who drowned in a riptide in Florida. 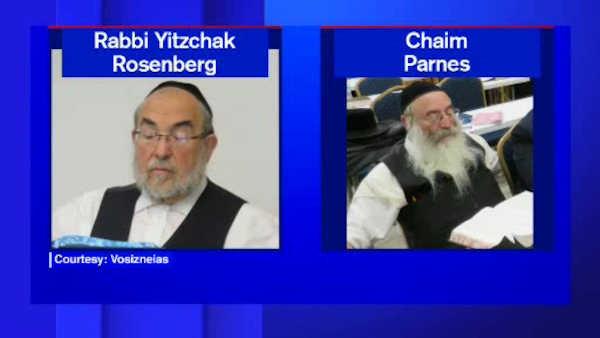 Rabbi Yitzchak Rosenberg and Chaim Parnes died during a morning swim Tuesday morning in North Miami Beach. A funeral was held in Williamsburg Wednesday morning for Rosenberg, and Parnes was laid to rest during the afternoon in Kiryas Joel. Their bodies were brought home on a private jet overnight. Both men were considered pillars of the Orthodox community in Williamsburg. Rosenberg, a father of eight, was the owner of Certified Lumber. He built the company from scratch, along with his brother, Abraham. Parnes was a diamond dealer in his hometown. He had survived a different brush with death when in North Miami he was beaten and robbed of $35,000 in diamonds just six months ago.